Gábor Palotás (1985) is a percussion artist who has earned an Honorary Diploma from the Music School of the University of Debrecen under the guidance of István Szabó. 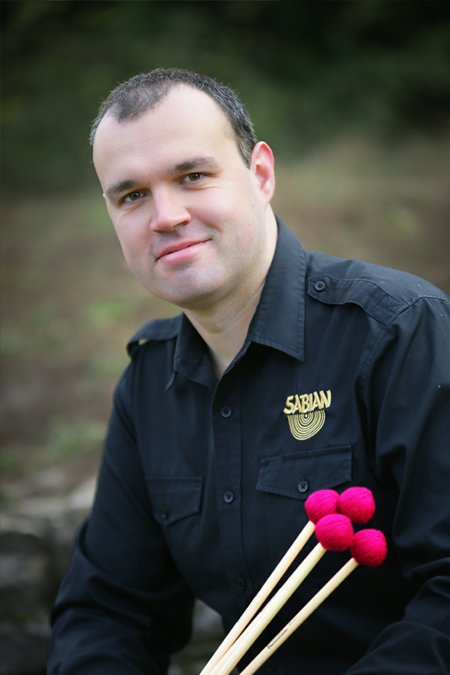 Since January 2008, he has been serving as the percussion teacher of the Zoltán Kodály School in Kecskemét, Hungary and works as a percussionist of the Kecskemét Symphonic Orchestra. As a soloist, chamber musician and orchestral musician, he has appeared in many European countries and has also performed in Japan, Israel, and the United States. During his studies, he received awards and recognition at several percussion competitions and has attended course from manyl internationally renowned artists. Gabor has won several other prizes including the Tibor Falu Foundation Prize in 2006, 2008-2009 Republican Scholarship, “György Gulyás in Memoriam” – János Józsa Prize in 2009. Since obtaining his diploma, he has had a growing interest in performing Hungarian percussion works. As his interests continue he has established an active relationship with an increasing number of Hungarian composers. As a result of these relationships, the number of works dedicated is increasing year after year. Gábor Palotás is endorser of Innovative Percussion and Sabian. For details information regarding his professional activities, see the appropriate menu items.